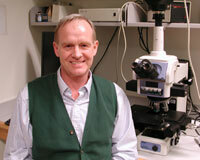 Doug Cavener is Professor and Head of Biology. He received his Ph.D. in Genetics from the University of Georgia and then conducted postdoctoral research at Cornell University. He joined the faculty of the Department of Molecular Biology at Vanderbilt University in 1982 and rose to the rank of Professor. In 2000 he moved to the Department of Biology of Penn State University where his research laboratory is located in the Developmental Biology Center of the Life Science Building. Dr. Cavener is interested in gene function and the regulation of gene expression particularly in the context of embryonic-neonatal-adult development transitions. Currently his research is focused on the function of the eIF2 alpha kinases, a family of protein kinases that regulate a diverse array of developmental and physiological functions in mammalian organisms including (1) the function and proliferation of the pancreatic insulin-secreting beta cells as related to the maintenance of glucose homeostasis and neonatal-juvenile diabetes, (2) the function and secretion of osteoblasts and chondrocytes in regulating bone development, (3) the regulation of neonatal metabolic homeostasis and postnatal growth, and (4) the physiological regulation of learning and memory and nutrient sensing in the brain. These studies rely upon the use of mouse genetic model systems that Dr. Cavener's laboratory developed, including transgenic, knockout, and tissue-specifically induced mutations. Discoveries made by Dr. Cavener's research group at Penn State are now being applied to understanding the cause and potential cure of human genetic diseases. Contact Dr. Cavener at drc9@psu.edu. 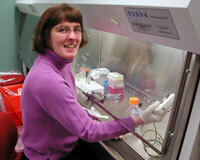 Barb McGrath is a Research Assistant Professor in the lab. Barb received her B.S. from Villanova University, her Ph.D. from the University of Connecticut Health Center, and did a Post Doc at Brookhaven national Laboratory. The primary focus of her research is to study how normal physiological stimuli affect PERK activity in pancreatic cell types and bone osteoblasts. The impetus for this project is the observation that the phosphorylation of eIF2a is dynamically regulated in the pancreas under normal physiological conditions. Since Perk is highly expressed in most if not all pancreatic cell types we postulate that its dynamic regulation is due to the sensing and modulating functions of PERK in the endoplasmic reticulum (ER) in response to physiological and nutritional stimuli. Barb is currently using pancreatic and osteoblast cell culture models to study the effects of physiological stimuli on PERK-dependent phosphorylation of eIF2a . We hypothesize that the effects of these stimuli on PERK function will be propagated by signaling pathways that cause the release of calcium from the ER into the cytosol. We hope to gain a better understanding of how PERK transduces environmental and nutritional signals to modulated stimulus coupled secretion in highly secretory cells. She is also interested in understanding how all 4 of the mammalian eIF2a kinases function alone or in concert with each other and has been establishing embryonic fibroblast (MEF) cell lines that carry one or more mutations of the eIF2 a kinases in order to explore the functions of this gene family in parallel with our studies in mice. In addition to her own research projects, Barb works with Doug Cavener to jointly advise and participate in the research of other members of the lab. Contact her at bcm5@psu.edu. 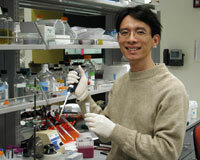 Feifan Guo is a Research Assistant Professor in the lab. She received her Ph.D. from the University of Tokyo in 2001 and did Post Doctoral work at the University of Minnesota and Beth Israel Deaconess Medical Center, Harvard Medical School before joining the lab at June 2005. Feifan has been doing research related to signal transduction pathways regulated by G-protein coupled receptors in PC12D cells as well as investigating transcriptional regulation of the TRH gene in vivo. She is currently researching the potential role of Perk in the central nervous system for diabetes, and/or learning and memory. Feifan can be reached at fug3@psu.edu. 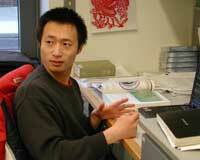 Daorong Feng is a Post Doctoral Fellow. She received her Ph.D in Genetics from Fudan University and held a Postdoc in the Department of Biochemistry, Hongkong University of Science and Technology before joining the Cavener lab. Daorong investigates PERK function in specific tissue. She is working to indentify a possible substrate of PERK in beta cells, osteoblast cells and chondrocyte cells, prove beta cells have proliferation problems in vitro and find its mechanism and also identify the possible function of PERK in osteoblast cells. Daorong can be reached at dut10@psu.edu. Shounak Gupta is a Graduate Student in the IBIOS program, Molecular Medicine option. He received his medical degree (M.B.B.S.) from the Kasturba Medical College, Manipal, in Karnataka, India. Shounak is working on elucidating the role of PERK in pancreatic beta cells. Contact Shounak at sug149@psu.edu. Kaori Iida is a Graduate Student in Genetics and received her B.S. from the University of Tsukuba, Japan. Kaori has been investigating the function of PERK eIF2a kinase in the exocrine pancreas using mice with a conditional knockout of the Perk gene in acinar cells. Kaori can be reached at koi100@psu.edu. Jen Leszl is a Senior Research Technologist. She received a B.A. with distinction in Biological Sciences from the University in Delaware in 2001 where she studied the gene expression of adipocytes. Since graduation, Jen has been at Penn State studying craniofacial phenotypes of mice with different genetic conditions for her M.S. in genetics under the supervision of Dr. Joan Richtsmeier. She joined the Cavener lab in May of 2005 to take over the job of managing the lab's extensive mouse colony. You can contact Jen at jml399@psu.edu. 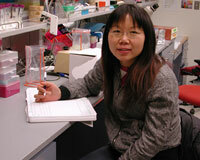 Yulin Li is a Graduate Student in Genetics. He received his bachlor of medicine from Beijing Medical University in 1998. Yulin is currently working on the characterization of metabolism defects in the neonatal PERK knockout mice. Contact Yulin at yzl106@psu.edu. Holly Preston is a Graduate Student in Biology. Holly received her A.S. from Corning Community College and her B.S. from UNC Wilmington. She is currently researching the effects of exercise on gene expression in bone and brain and the effects of PERK on the brain and pancreas. Contact Holly at hmp131@psu.edu. Xiaoyi Sheng is a Graduate Student in Genetics. 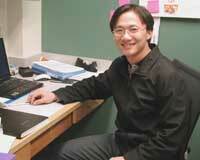 He received his B. S. in Biological Sciences from Fudan University, Shanghai, China. 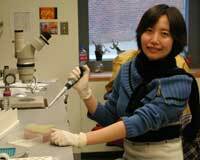 Xiaoyi's research is focusing on the bone defects of PERK eIF2alpha kinase deficient mice using micro-CT technology. He is also in the process of generating transgenic mice that have conditional rescue of PERK under a global KO background to investigate the tissue and developmental specific roles of PERK. Xiaoyi can be contacted at xzs102@psu.edu. Dong Wang is a Graduate Student in Biology. He received his B.S. in Biological Sciences from Tsinghua University, Beijing, China. Dong is currently trying to identify potential proteins that interact with the PERK kinase domain using the SOS recruitment system. He is also working with tetracycline controlled ratPERK expression in a stable MEF cell line. You can reach Dong at dzw115@psu.edu. Jianwen Wei is a Graduate Student in Genetics. Jianwen received his M.S. in Genetics in the Department of Biochemistry, Sun Yat-sen University, China. His thesis research is focusing on studying eukaryotic translation initiation factor 2-alpha kinase 3 (PERK)’s function in skeletal development. Jianwen is trying to figure out the possible role of PERK in osteoblast (proliferation, differentiation, apoptosis and bone formation), via both in vivo and in vitro approaches. Contact him at jxw387@psu.edu. 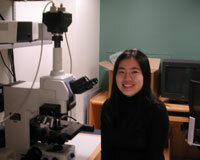 Vivian (Wei) Zhang is a Graduate Student in Genetics. She received her B.S. in Biology from Shanghai Normal University and received a Master in Medical Genetics from Shanghai Medical University. Vivian is working on the Beta cell defect of Perk Knockout mice by investigating the molecular mechanism underlying the Perk KO phenotype via a mixed application of genetics, physiology and morphology. Contact her at wzz100@psu.edu. Katie Maher is a senior, majoring in Biology. She joined the lab in the Fall of 2002 through the WISER undergraduate research program, and is working on a project that involves examining the bone volume of PERK knockout and transgenic mice. Katie is also involved in protein and RNA analysis of chondrocytes cultured from the same mouse lines to determine differences in cellular expression. Contact Katie at knm141@psu.edu. Hanna Xu is a sophomore majoring in Biology. Hanna works on the immunohisto-chemistry of ngn3-cre mice and is observing the effects on the endocrine pancreas, including the number changes in the alpha and beta cells. She is also working on beta cell proliferation and apoptosis. Contact Hanna at hix5000@psu.edu.